Houses affected by a flood in Niger State. President Muhammadu Buhari has delegated authority to the Director-General of the National Emergency Management Agency (NEMA), Mustapha Maihaja, to declare a “national disaster’’ if the anticipated flooding becomes a reality in parts of the country. According to a statement by the Senior Special Assistant to the President on Media and Publicity, Mr Garba Shehu, President Buhari’s directive was contained in a letter entitled ‘Situation Report on the River Flood Along the Banks of Rivers Benue and Niger’. The letter was signed by the Chief of Staff to the President, Abba Kyari. The President’s directive follows a warning by the Nigeria Hydrological Services Agency (NIHSA) that Rivers Benue and Niger had almost reached levels that resulted in flooding in 2012, which led to the loss of lives and destruction of property. It also comes just two days after floods hit Niger State leaving 40 dead and over 100 communities submerged. 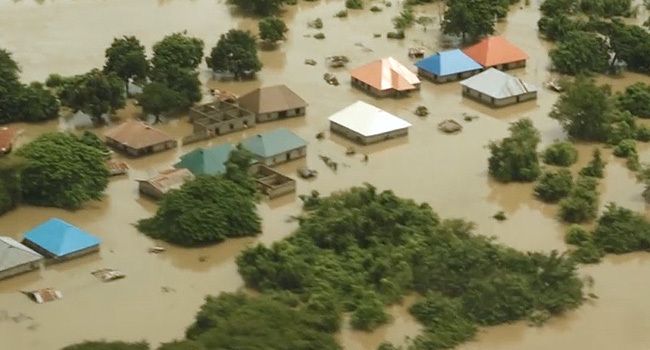 In a statement on September 6, NIHSA had warned that Nigeria risked witnessing a repeat of the catastrophic flooding of 2012 due to the steady rise in water levels and weather forecast for the coming weeks. Days after, its fears started becoming a reality with news of flooding being reported in parts of the country. On Thursday, more than 100 communities in Niger State became submerged as River Niger overflowed its banks. Farmlands and houses were destroyed, leaving residents of the affected communities homeless. The state Governor, Abubakar Bello, who visited the communities with other members of the state executive, appealed to the Federal Government to intervene as the situation was beyond the state.